Two decades ago, Rajamani Bhattar, a temple priest of Tirunelveli, brought up in Vaikanasa Agama tradition and an upasaka of the Anjaneya, was blessed by Guruji Haridos Giri Swami and he was presented with the idols of Sri Rama, Sita, Lakshmana, Anjaneya and a Shadchakra Saligrama at Thennangur. The Swami had made an apocalyptic statement that the votary would build a shrine for Anjaneya. 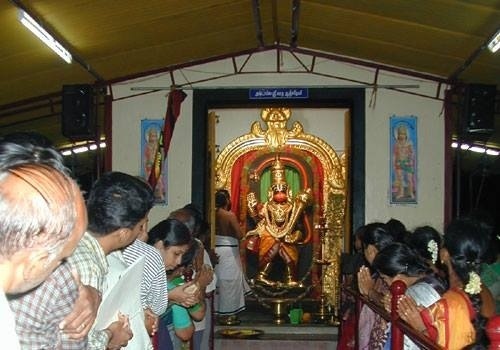 In the year 2004, a divine call directed him to devote his entire time and resources to construct a shrine for Anjaneya at the spot indicated in his dream, at Peelamedu in Coimbatore. Located on a spacious plot of ground tucked a few meters away from and on theCoimbatore-Avinashi road, opposite ESSO bus stop (near Suguna Kalyanamandapam) the Ashtamsa Sri Varada Anjaneya is endued with eight special features. Hence its uniqueness in standing apart from other temples dedicated to the Anjaniputhra. Normally Hanuman is portrayed with His folded hands praying to Sri Ramachandra. But, the gomukhi-structured idol of the deity here, in Peelamedu facing west and measuring eight feet is of a different kind. And many more unique featrues of the lord Hanuman can be found in this temple.